This text editor will allow you to write and edit for HEX, HTML, PHP and other programming language. There are many advanced features that include syntax highlighting/coloring for many languages, as well as code folding, brace matching, hex editing, style builder and column/block editing, text formatting, alignment, and centering are also featured. It supports files sizes 4GB and larger. 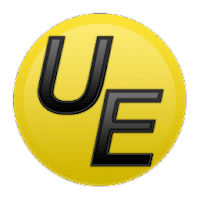 UltraEdit is shareware app that can be evaluated for free for 30 or 15 days, depending on usage. After the expiration of this period, the application will work only with a regular license key. Includes unlimited lifetime tech support and up to 3 unique installs! Disclaimer: Direct downloads for the lastest version of UltraEdit 26.00.0.62 are provided by the official software's author, we can't guarantee safety, availability or download speed. Moreover, we don't and we won't provide any pirated/illegal versions or tools. We recommend you to avoid it as these methods can harm your device. If you like the software, buy it to support the developers. (We provide software discounts for many worldwide brands).